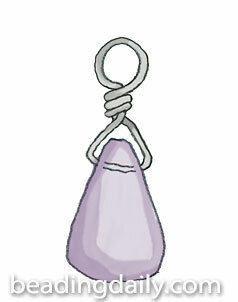 Wrapped-loop bails turn side-drilled beads, usually teardrops or briolettes, into pendants. Center the bead on a 3″ or longer piece of wire. Bend both ends of the wire up the sides and across the top of the bead. Bend one end straight up at the center of the bead, then wrap the other wire around it to form a couple of coils. Form a wrapped loop with the straight-up wire, wrapping it back down over the already-formed coils. Trim the excess wire.